This ornament was just for fun, there’s no special technique involved here. I apologize for the poor picture today as it’s snowing here, so it’s almost to dark for pictures. 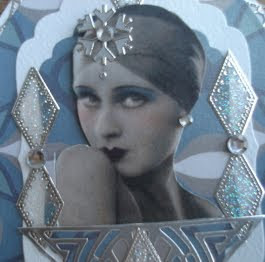 My Retro Lady is a graphic from “Magic Moonlight”, and she is just a headshot. I would love to see a full scan of her, as I bet she is beautiful! My stickers are from “Plane Class”, Designer papers from G. C. D. Studios. Thank you for popping in today; hope you have a snow shovel handy as it sounds like it will be a long and messy weekend. Your ice Goddess is Gorgeous! I wonder if she calle for the snow? hope its not to much. 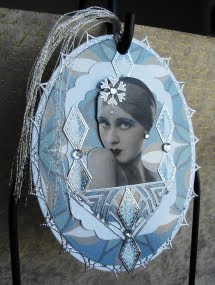 I love the edge treatment on your ornament- this is stunning! I hope you do not get too much snow- it is so pretty when it is falling, isn't it? And a Goddess she is! Vada, your ornament is absolutely beautiful! Have a warm and happy weekend!